I heard it when I was a kid and I still hear it now: you are what you eat. Well, as I’ve discovered over the years, this age-old phrase is sometimes right, but not always. For example, if you eat healthy fats, it’s not likely you’ll gain fat. Nevertheless, there’s one way it rings true that you’ll definitely want to know about, because it affects your brain. Before we get to that, I have to say that in broader terms, the “you are what you eat” phrase is quite true—and recent research would agree. If you eat a healthy diet that’s rich in fruits, vegetables, lean protein, and healthy fats, you’re more likely to be at lower risk for a number of health conditions than a person whose diet contains plenty of calories from processed, sugary foods filled with trans-fat. But a recent study I came across takes this one step further. It’s become common knowledge that a healthy diet can slow down the effects of physical aging, but this new study shows that it’s possible a calorie-reduced diet can slow down mental aging, too. 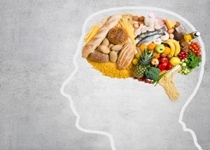 According to these findings, “you are what you eat” applies to both your body and your brain. Neuroscientists at New York University have shown that a calorie-reduced diet can stop the rise and fall of activity levels in almost 900 genes that are linked to aging and memory formation. They say that diets with fewer calories from carbohydrates likely deter certain aspects of aging and chronic disease. Although the experiment was conducted on mice, I do believe these results will stand when it comes to humans. We’ve seen from previous research that diets featuring lower calories and nutritious food can prolong a person’s life by lowering their risk for diseases like type 2 diabetes, hypertension, and heart disease. We also know that if you’re not using the extra energy (calories) you’re taking in, it can lead to the addition of body fat, metabolic problems, and greater difficulties for overall organ function. What is important to note are the potential benefits of a low-calorie diet for memory and learning ability. By stopping the genetic fluctuations, it’s likely putting less stress on the brain, allowing it to function better for longer. This adds further support to the theory that what’s good for the body is good for the brain. Your brain needs fuel, and the best fuels for a healthy brain are healthy fats (including omega-3), fruits, vegetables, lean proteins, and an array of vitamins and minerals. When you have too little of these foods in your diet and too many carbohydrates, sugary foods, high-cholesterol foods, and processed foods, you can experience inflammation and plaque accumulation in your arteries and brain, impairing your cognitive function. NYU Langone Medical Center, “Calorie-restricting diets slow aging, study finds,” ScienceDaily web site, November 17, 2014; http://www.sciencedaily.com/releases/2014/11/141117110650.htm. Wegerer, J., “Nutrition and Dementia: Foods That May Induce Memory Loss & Increase Alzheimer’s” Alzheimers.net web site, January 2, 2014; http://www.alzheimers.net/2014-01-02/foods-that-induce-memory-loss/.